In this modern age of technology it's no wonder we have many a late night staying up surfing the web, playing video games and texting friends. We eat too much, stress a lot and sleep far too little. 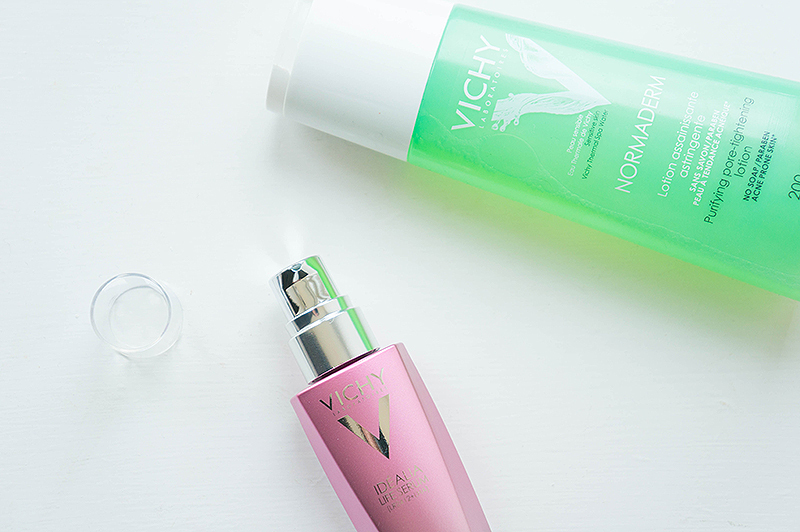 Enter Vichy's wonder serum that's here to combat all our indulgences and repair our tired and frankly lacklustre skin. The Vichy Idéalia Life Serum claims to freshen the complexion, even skin tone, rest your features while refining pores. This lovely little product has been tested under excessive life conditions, perfect for your average on-the-go girl. When I was approached to test this new serum out I couldn't believe just how perfect it was, especially after hearing that 8/10 women had found their skin more beautiful after use. How could anyone say no to that?! Essentially there's a lot of science behind this one, there's 27 patents pending, 10 years of research and a whole lot of molecules involved. This serum definitely packs a punch and, being suitable for all skin types, is nothing to sniff at for the fairly reasonable price tag. I've been using this morning and night for a few weeks now and can't believe the quality and youthful texture to my skin. Not only does it feel plumper, smoother and more defined but I'm already seeing a reduction in my pores and my skin pigmentation is much more even. I'm actually blown away by how this serum has worked as I thought it might just be a marketing ploy, but have been more than pleased with the results. It sinks in quickly, without any pilling, smells like green tea and looks pearlescent in the light. I actually look forward to putting this on every day! 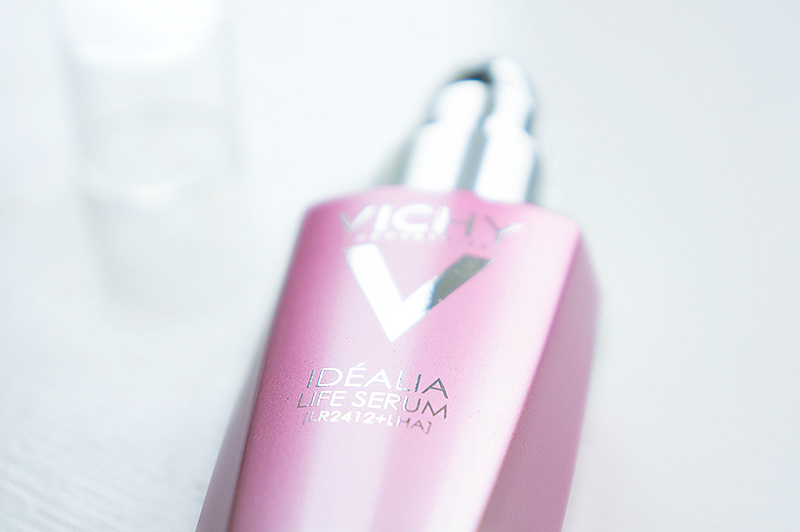 Would you try the Vichy Idéalia Life Serum? What do you currently use? Really like the sound of this! I really want to try l'oreal's new serum too! L'Oreals new serum looks amazing! I have to say that I've been blown away by this, though! This sounds lovely, like something I need! I don't think I'll be replacing this in my routine for a good while, it just works! Im after a new serum - I love Vichy products! Same, they're always so gentle on my skin. Michelle, you'd love it! I'm the same, I try to get my recommended hours, but it just doesn't always happen. This has made me look a little bit more 'fresh' in the morning. Me too, looks so pretty on the dresser! I've definitely noticed a reduction in the redness on my cheeks. I don't know if this is purely the serum or if it's helped paired with my Hydraluron too. Fab review lovely, your photography is so stunning too. I'm enjoying this so much, it smells lovely! I'm a new follower of yours! This sounds like something that would work great for me! Thanks Katie, I'm glad you found the review useful. Sounds like pretty cool stuff! I'm intrigued by the pearlescence + green tea smell! wahhh, second/third review i've come across on this serum in the past week. It sounds like a miracle worker and just moved its way up to the top of my wishlist!! Oh really? :) I'm so glad you think so. I actually believe it's so reasonably priced and will last ages because you only need the smallest amount. After all the positive reviews on this serum this last week I gave in and ordered one from Boots (thank God for birthday money from Grandparents!). I can't resist something that will make me look well rested and less pink faced! That's a really good offer with it being 25% off, as it's definitely worth the full price point. I look forward to using this day and night. Thank Rosie. :) Haha, this is exactly what I said to myself during summer, so we'll have to make a pact. This sounds like a dream product! I've been meaning to add a serum to my skincare regime (as if its not complicated enough already! ), but have no idea which one to go for, especially since it is a bit of an investment! I would have to say this is the best serum I've tried, and I'm a bit of a chameleon when it comes to them. I don't see myself switching unless something else 'revolutionary' comes out. You've made me so excited for this serum! I'll be purchasing mine tomorrow! Glad you liked it Kelly!